Car Accessories. Car Starter App. There is an app for almost everything including remote start your car from your phone. At Auto One, we carry many different brands of car starter apps*. Directed Electronics (Viper, Avital, Python) call it SmartStart. 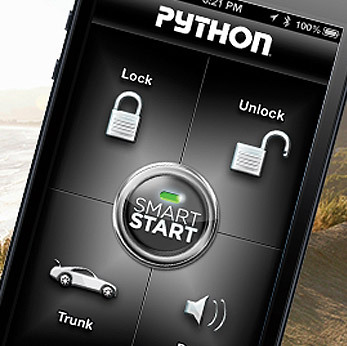 Regardless of which brand you purchase, to use your smart phone to remote start your car, you will need a smart phone app compatible remote start system like the Python 4806P or the Prestige APS687E. With the right remote start system installed, you will also need the car starter app (from the iTunes store or Android Play store) and a subscription to the smart phone app service. Visit your local Auto One for more information about car starter apps or get a free online quote. Beyond starting your car from anywhere in the world with cell phone service, car starter apps can also provide you with a variety of features*. Some features are brand specific. Some features require additional add-on services and/or accessories. The 2-way cloud connection let's you interact with your car like never before. Smart phone remote start apps can also be used to control several cars from the same app. If you are looking for a teen driver monitoring systems, the SmartStart's area fence and speed limit notifications are for you. Auto One Glass and Accessories carries the best remote start apps from the top manufacturers in the industry. Visit these manufacturer sites or your local Auto One for more information. *Not all car starter apps are available at all Auto One locations. The Auto One blog has feature articles about remote starter apps and remote starters.